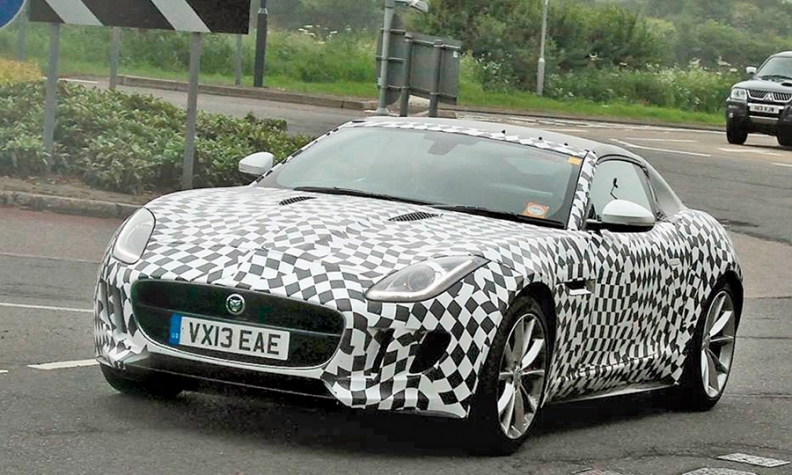 A Jaguar F-Type coupe, shown in this spy photo, is expected next year. Jaguar's new F-Type roadster -- and the coupe version coming next year -- are important halo cars, but the English brand really needs an entry-level car to attract younger buyers. That won't happen until late 2014 when a compact sedan is expected to debut, followed by a coupe and possibly a station wagon. The compact Jaguars will have stiff competition from a redesigned Mercedes-Benz C-class sedan and coupe and BMW's 3- and 4-series cars. Domestic carmakers also are targeting the segment. Jaguar, owned by India's Tata Motors, also is working on a compact crossover to compete with the Mercedes-Benz GLA and Audi Q3. Here is a summary of Jaguar's product plans. F-Type: A coupe variant of the new two-seat roadster is expected next year. It will get the supercharged 380-hp V-6 and the 5.0-liter V-8 that powers the rest of the passenger car range. Compact sedan: Jaguar won't fill the biggest gap in its product line until late next year when the sub-$40,000 rear-wheel-drive sedan is expected. The car could be called the Q-Type, a name Jaguar has trademarked. Jaguar is expected to use aluminum extensively for the body. Power would come from the turbocharged 2.0-liter inline four-cylinder engine available in the XF, and the supercharged 3.0-liter V-6. A coupe and possibly a station wagon could follow in 2015 and 2016. XJ: The large sedan and its long-wheelbase XJL derivative will be redesigned in 2017. There are reports that a coupe model to compete with the Mercedes-Benz CLS is under consideration. XF: This sedan competitor to the BMW 5 series will be redesigned in 2015 and will switch to an aluminum body. A coupe version is expected in 2016. XK: Jaguar is said to be rethinking plans for this coupe and convertible. With the debut of the F-Type, the XK may move upmarket and get larger to allow roomier rear seats. The larger version likely would debut in 2017. Compact crossover: The rwd and all-wheel-drive crossover will share a platform with the compact sedan. To set it apart from Land Rover, the Jaguar crossover is expected to have coupelike proportions and short overhangs. It is expected in early 2015.